PODCAST 82 IS GO FOR LAUNCH!! 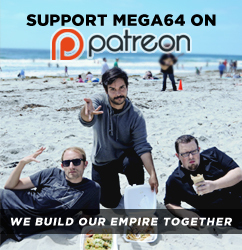 Due to the lack of any real news today, we here at mega64 are proud to present, Podcast 82. Once again, we streamed this podcast live. What was meant to be a live stream of just the podcast instead turned in to an all night, 12 hour marathon of endurance. We were joined in our lack of sleep by many of you, and for that we tip our hats. Anyone who can sit there and watch Rocco recite half of "Willy Wonka and the Chocolate Factory," is more man than I. For those of you who missed our half a day live stream, fear not, we still have the original podcast here for your viewing pleasure, and with the lack of things on TV today, what else are you going to do with your time. Audio folks click here! Thanks guys, I am sure we will do something like this again, and next time we will give you all much more of a heads up.